My friend Andrew kindly let me photograph him making kimchi yesterday, which turned out to be such a pleasure that i’m making this post out of it. 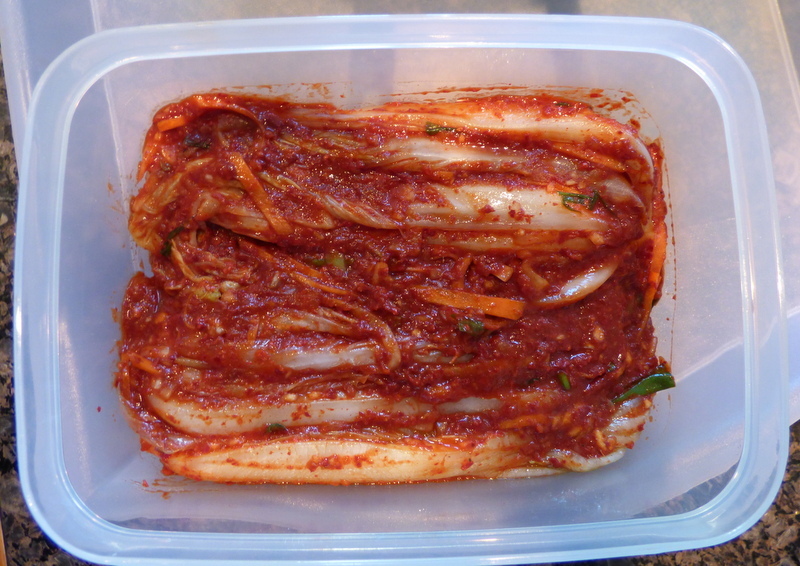 Kimchi? you ask. But wait. A Han and an Anglo-Saxon making a Korean delicacy? What could go wrong? Well, not much since Andrew is a highly skilled experimental chef and wisely thwarted my need to pitch in by limiting my only contribution to just rinsing a handful of utensils, and that, under close supervision. Besides, he’s done this before and followed the detailed recipe on Maangchi, a splendid Korean recipe site. He’d started by spending the morning prepping the ingredients, knowing full well that if this were not done before i arrived, i’d be standing around whining and reaching for knives. So when i arrived, everything was already mise en place. Like the juilenned scallions, daikon, and carrots. 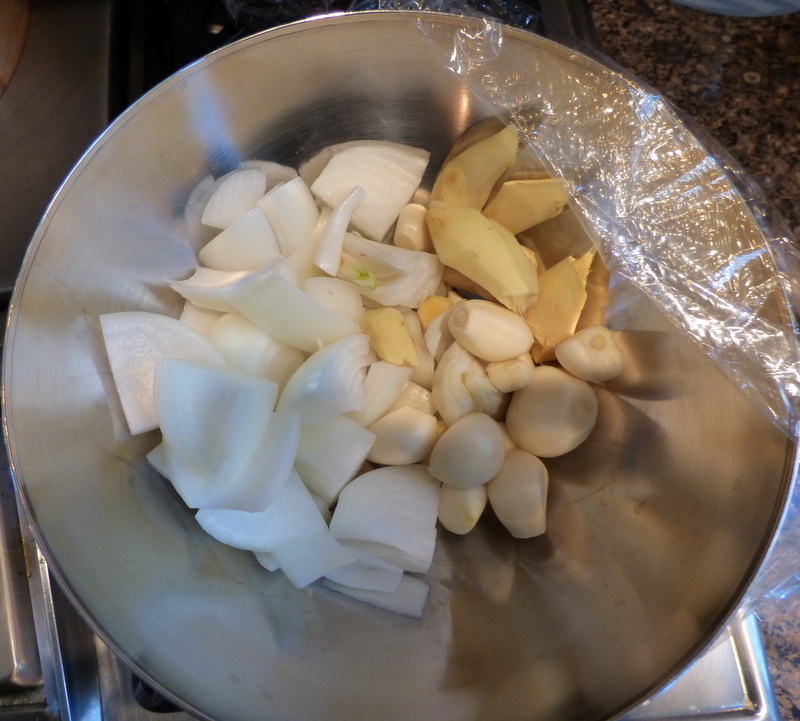 The peeled onion, garlic, and ginger. The cincalok. 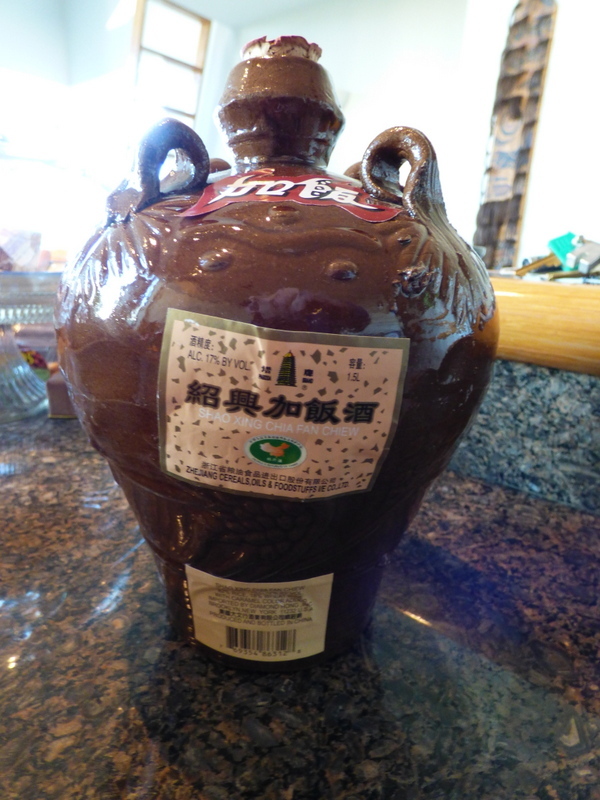 Do pay attention to the caution in the last paragraph of that link and open the bottle gently over a bowl, as the fermentation process tends to cause it to leave the bottle of its own volition once you remove the cap. I’d never had this stuff, yet another Asian spin on good old Roman garum, but it’s so flavorful that it makes plain old Thai/Vietnamese “fish sauce” seem bland. As does the smell. You can see that this bottle has already been opened. 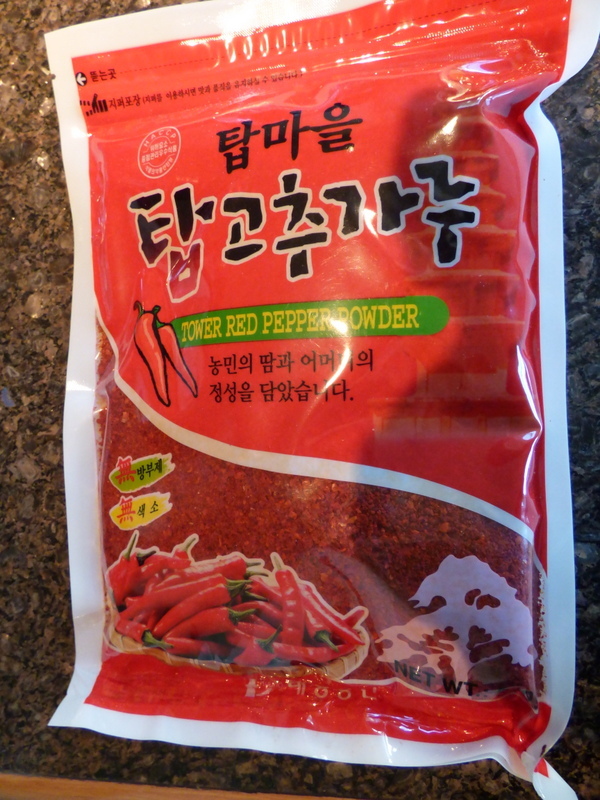 The Korean red pepper. This has its own distinctive taste without being quite as hot as western red pepper. The grind is somewhere between chile powder and chile flakes, much coarser than American chile powder. 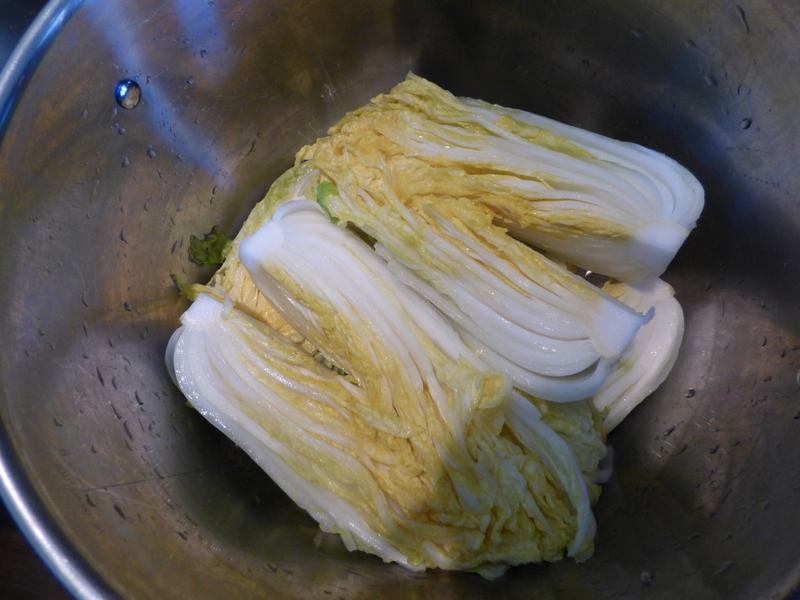 And young nappa cabbage, quartered lengthwise and brined. We’re so hopelessly provincial here in the Greater San Francisco Bay Area that we believe St. Francis was named after us, so naturally we spell nappa cabbage “Napa”. It’s not. “Nappa” is regional Japanese referring to vegetable leaves. 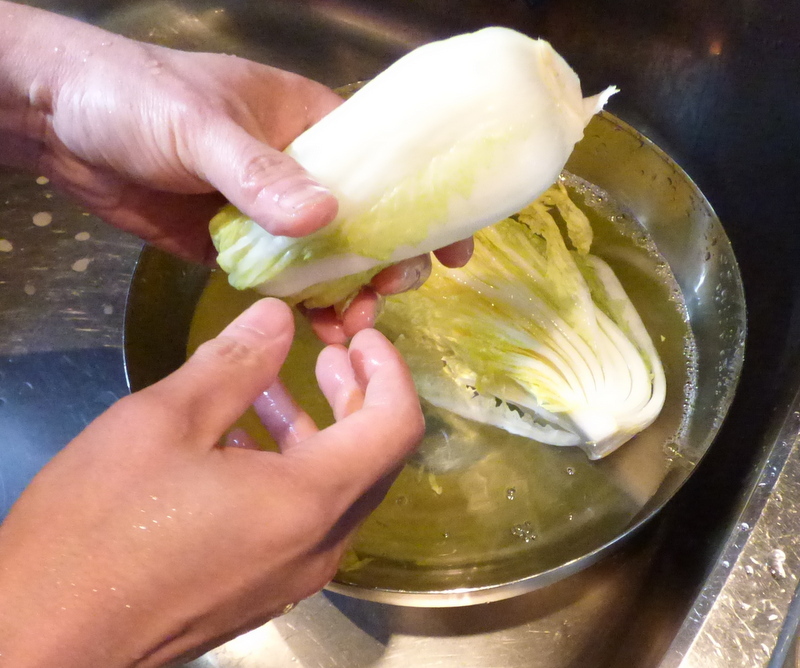 The first step is to rinse, gently loosen, and wring the excess moisture from the brined nappa cabbage. 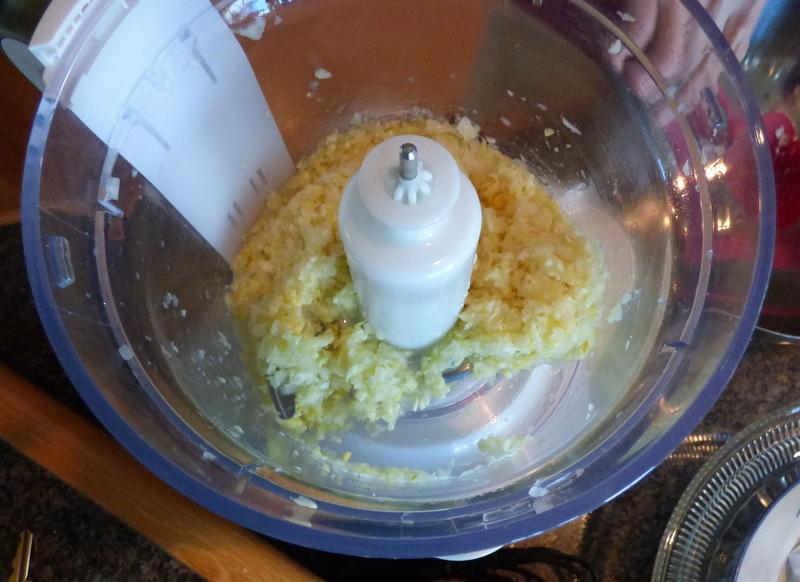 Then toss the peeled onion, garlic, and ginger into the food processor and grind it down very small. 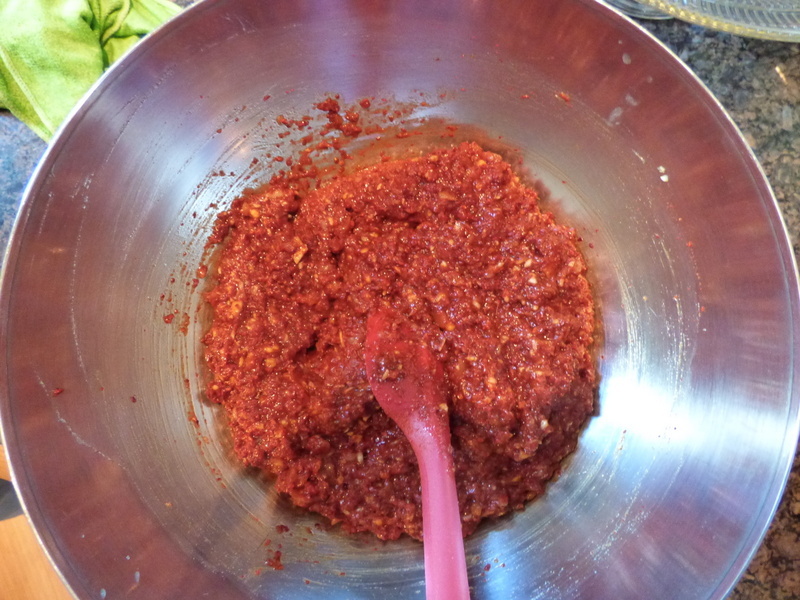 Throw in slugs of cincalok, Chinese rice wine, and Thai fish sauce and continue grinding. Then add two whole cups! 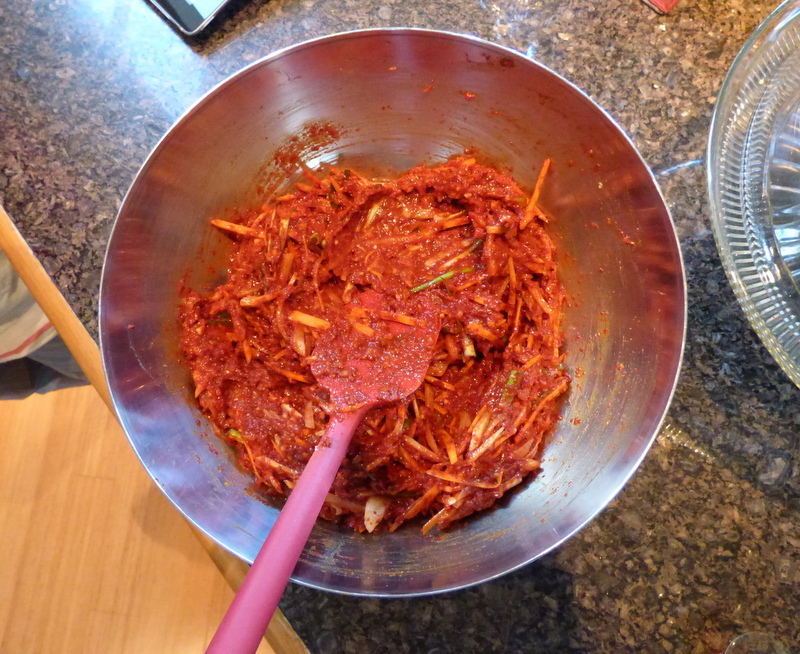 of that Korean red pepper, finish grinding, and dump into a mixing bowl. 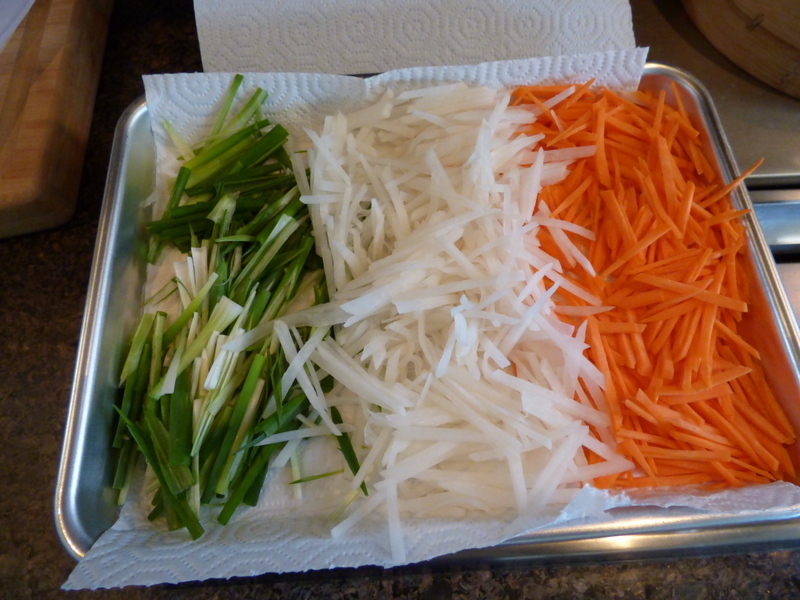 Mix in carefully the julienned scallion, daikon, and carrot. Evenly distribute this mixture between the leaves of the cabbage. And place the packed leaves into a container. This one’s small because he gave it to me so i could ferment it myself. But wait. 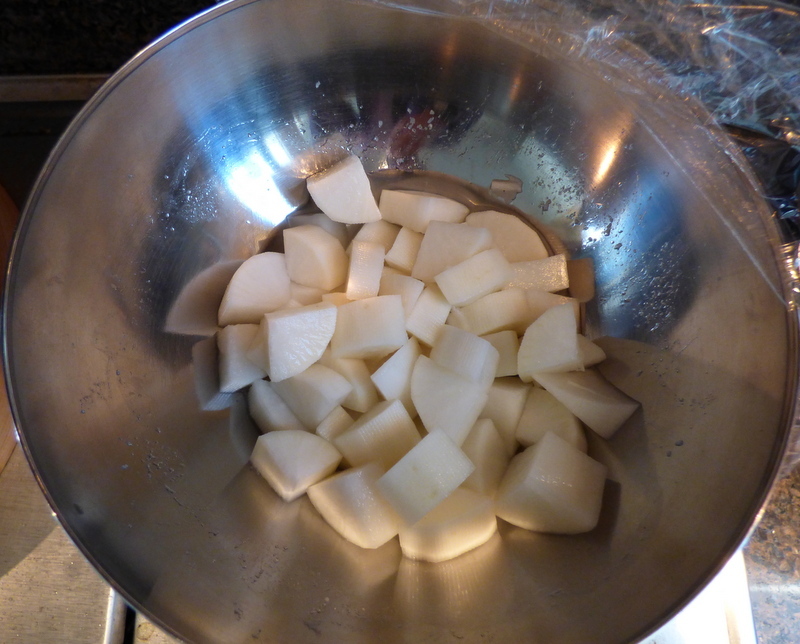 Close readers will be wondering what happened to the chopped daikon? That just got mixed with the leftover stuffing mixture and stored in the refrigerator for a pungent little Happy New Year garnish. And one to you, too. Well, except that some of Maangchi’s recipes are sugared unnecessarily, and sometimes she uses odd shortcuts. I hope that the result tastes good, regardless! Busted! I forgot i had Korean readers who would know all about kimchi. Many thanks for the warning about Maangchi’s recipes. 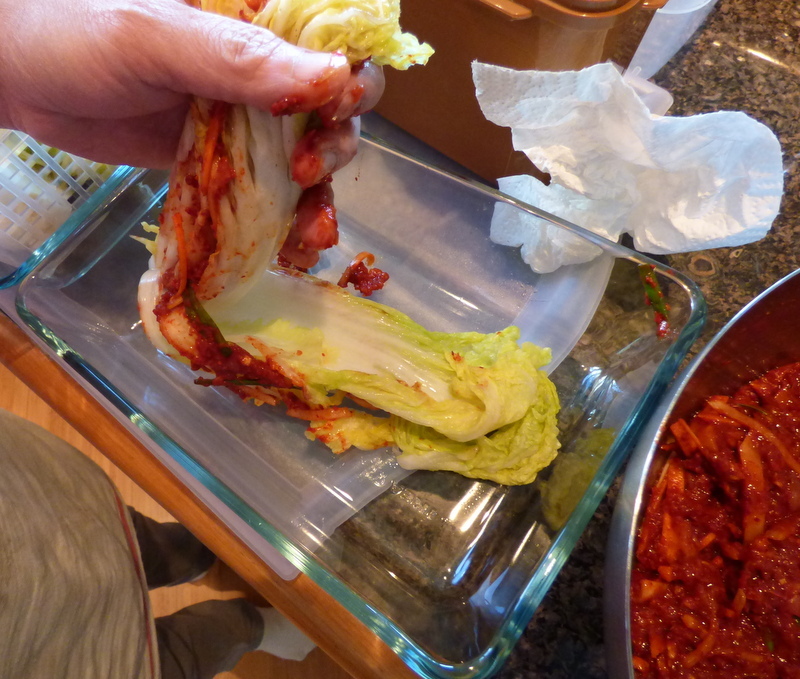 My only experience with kimchi before this endeavor was eating it, so i brought a vanishingly low level of expertise. The good news is that i just ran into the kitchen to check it, as it hadn’t seemed to have begun fermenting. Held the container up looking for little bubbles and, to my disappointment, saw none. 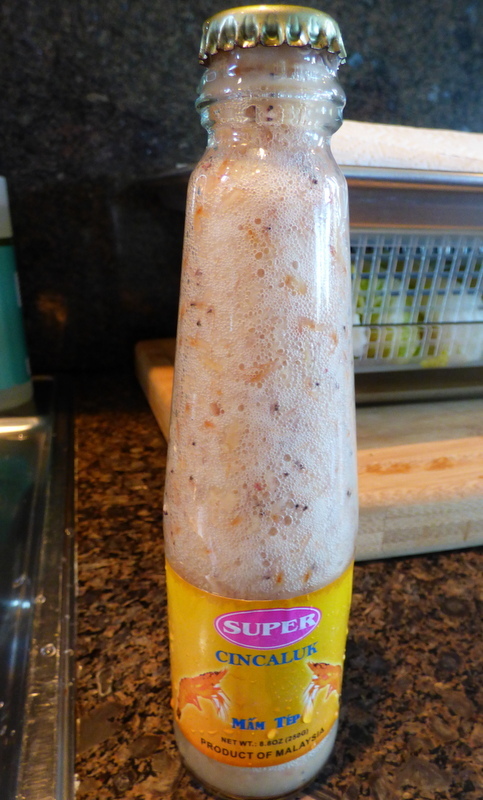 But then, since i’d inadvertently squeezed the container, caught a whiff and realized, oh yes, it’s fermenting well. It’s all Andrew. All i did was take the photos and wash a couple of utensils before he drove me away from the sink.